The Satsuma Fire Rescue Department is currently seeking individuals who are 18 and older that would like to volunteer as a medical first responder, a fire fighter, or in a support role. Experience is not required, just a willingness to learn and the desire to serve your community. Contact Chief Clyde Miller at 679-1640 or stop by the fire station any time. 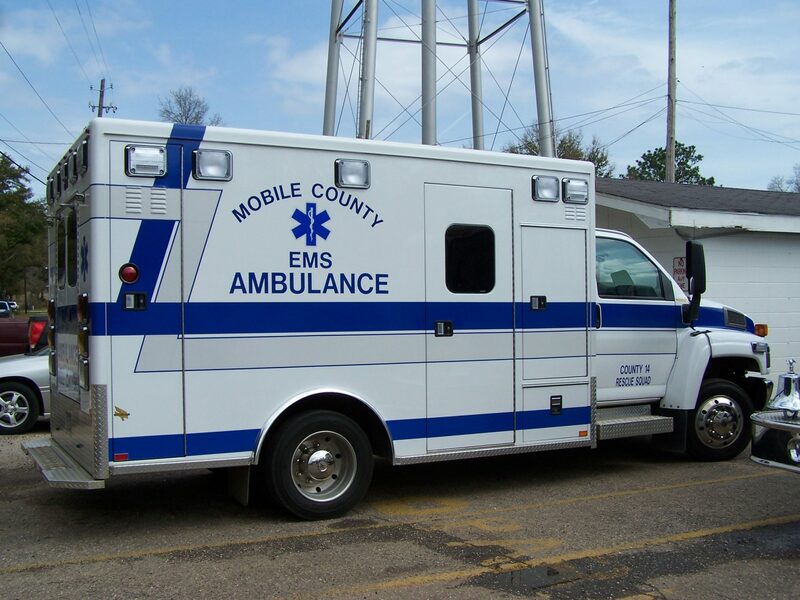 The City of Satsuma, through the Satsuma Fire Department, has entered into a cooperative agreement with the Mobile County Emergency Medical Services System. This agreement provides direct 911 dispatching to the Fire Department for all emergencies. 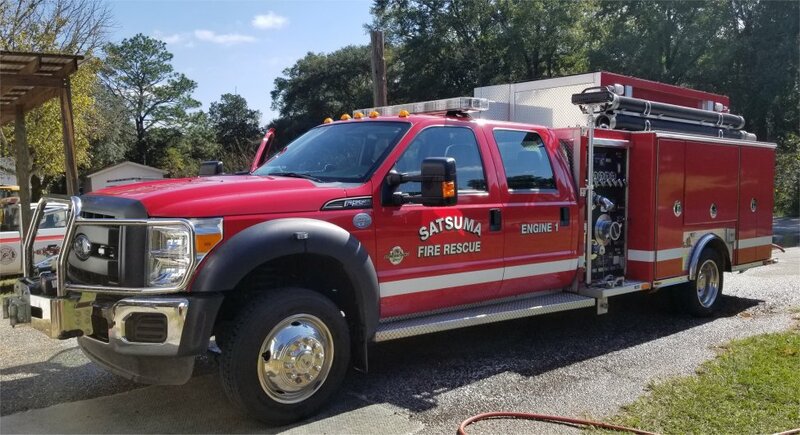 The Satsuma Fire Rescue Department is committed to providing high quality fire and rescue services to the City of Satsuma. Life safety and the protection of property are our number one goals. In addition to traditional firefighting and EMS services, Satsuma Fire and Rescue has a water rescue team. Steele Creek Lodge in Satsuma has become a major starting point for recreational boaters, anglers, and fishing tournaments. The rivers and bayous in our area are busier than ever. Satsuma is working with and seeking to complement the existing enforcement role of the Alabama Marine Police and U.S. Coast Guard as well as the recover mission of the Mobile County Sheriff’s Flotilla. The Satsuma Fire Rescue Department is a “combination” fire department meaning it has both paid career fire fighters as well as volunteers. The fire department is managed by a fire chief and up to six other full time fire fighters. The full time fire fighters work a traditional 24 hours on and 48 hours off shift schedule, with two full time fire fighters staffing the station at most times. The Satsuma Fire Rescue Department was originally an all-volunteer fire department. Citizens of the city have a great heritage of serving in many volunteer boards and councils. The fire department is no exception. There are around 30 volunteers that participate in the department. 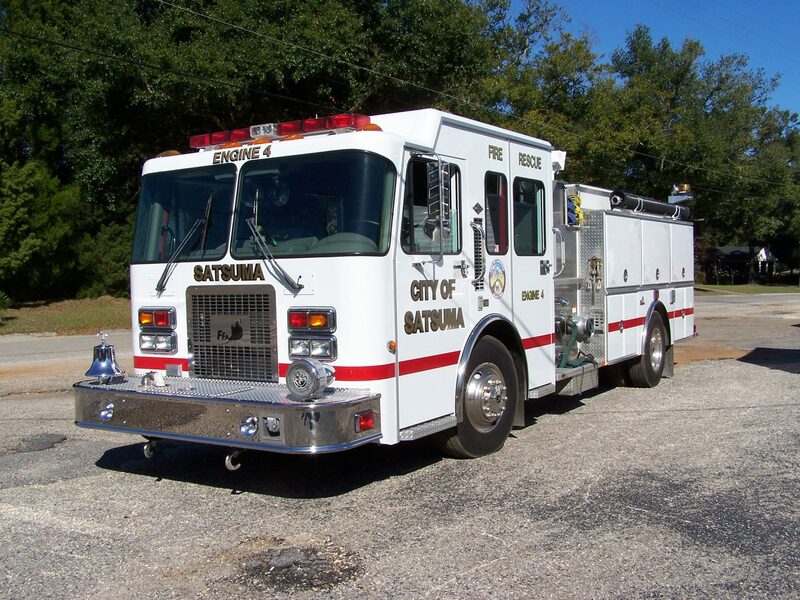 The Satsuma Fire Rescue Department has a modern fleet of fire apparatus to serve the City of Satsuma. All three fire engines are equipped with hundreds of feet of fire hose, emergency medical equipment, and various hand tools and appliances. In addition, the department carries vehicle extrication hydraulic tools and brush fire fighting gear. 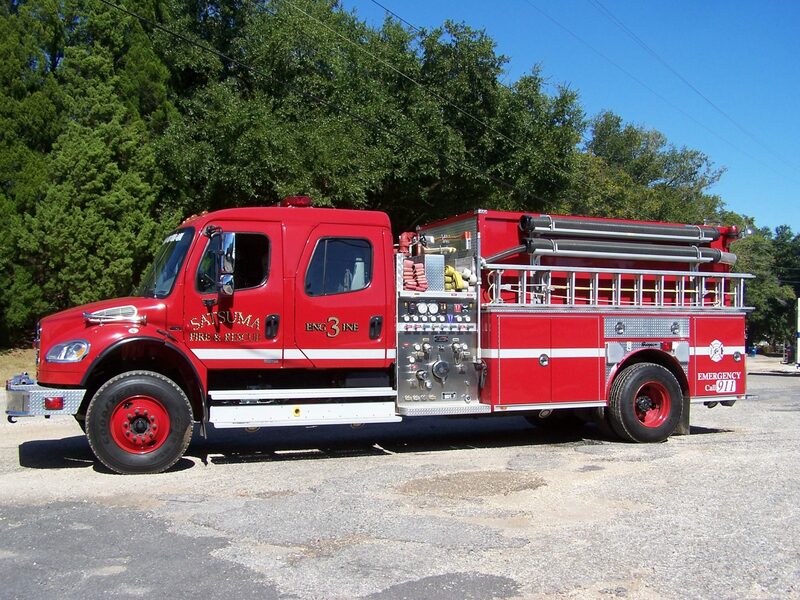 The Alabama State Forestry Division manages a program from the U.S. Department of Defense where surplus vehicles can be given to Fire Departments. The Satsuma Fire Department has received two such vehicles. 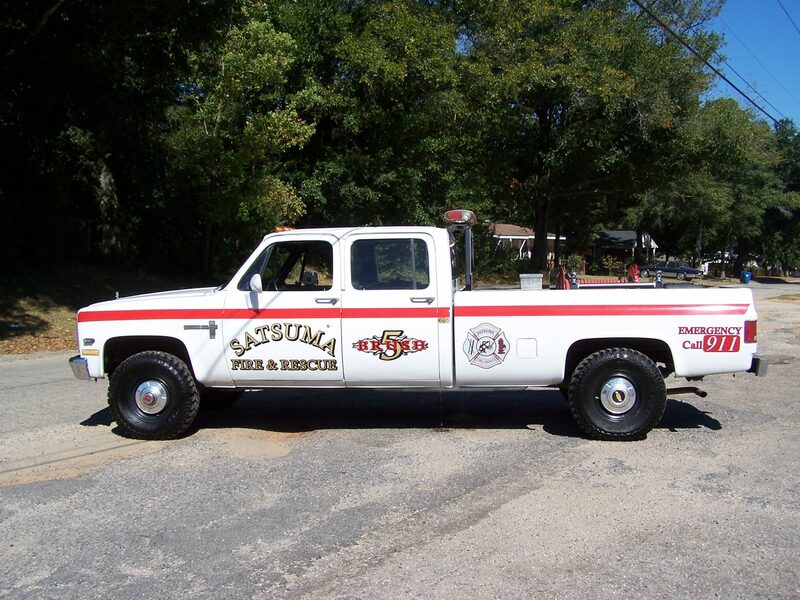 In 2009, Satsuma Fire Department took delivery of a crew cab pickup truck that has been modified into a type 6 Brush Fire Truck. The full time staff members of the fire department are all certified fire fighters as required by the State of Alabama. Some are also certified as Emergency Medical Technicians, Hazardous Materials responders, and other specialized areas. The volunteer fire fighters and support personnel conduct meetings and participate in training each week. During each year, the fire fighters and support personnel train on firefighting skills, CPR, vehicle extrication, hazardous materials response, driving and pumping trucks, safety, and incident command. Members may also attend other classes such as those offered by the Mobile County Association of Volunteer Fire Departments and the Alabama State Fire College. The City of Satsuma is a growing community and a crossroads to other regional development. This is creating a growing demand for services from the fire department. The yearly call volume averages around 730 calls with over 90% being requests for emergency medical assistance.